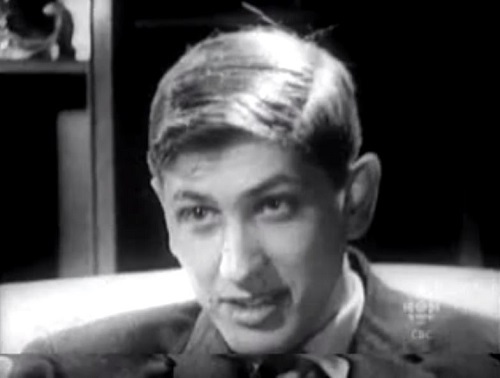 On the topic of Chess and Women and, in particular, Bobby Fischer’s views (C.N.s 9218 and 9253), Olimpiu G. Urcan (Singapore) notes a remarkable interview with Fischer (Canadian Broadcasting Corporation). ‘Wir wissen, daß in offener Stellung drei Tempi ungefähr einen Bauer ersetzen.’ Page 45 of Richtig Opfern! (Leipzig, 1935). 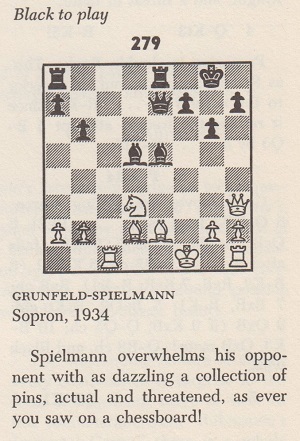 From page 93 of The Art of Sacrifice in Chess (London, 1935): ‘We know that in an open position three tempi are approximately equal to a pawn.’ From page 85 of the Reinfeld/Horowitz revision (New York, 1951) of J. du Mont’s translation: ‘We know that in open positions, three tempi are approximately worth a pawn.’ Although the volume by Reinfeld and Horowitz was an extensive rewrite, it was used in the ‘21st Century Edition’ (Milford, 2015) without any mention of them. 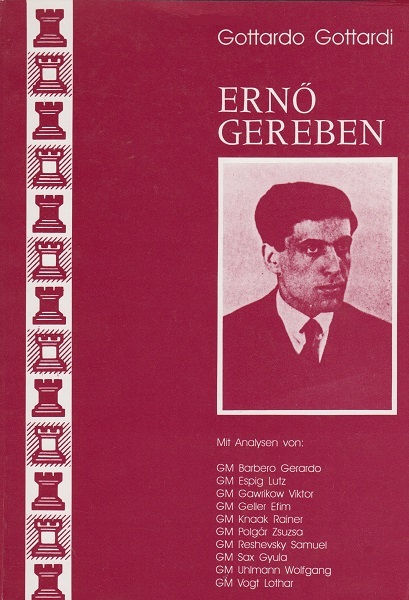 The most detailed account of the Grünfeld/Gereben name-change known to us is on pages 11-13 of Ernő Gereben by Gottardo Gottardi (Kecskemét, 1991). 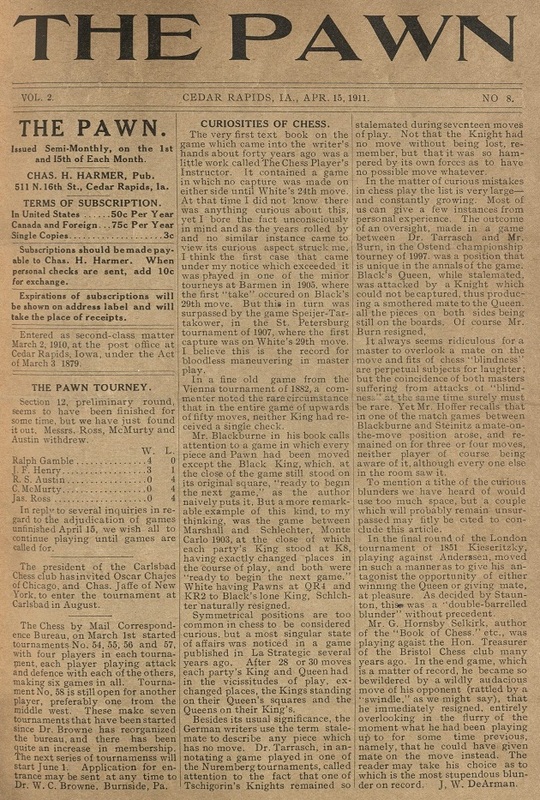 If a reader has access to December 1921 editions of the Sunday Express it will be appreciated if the reference in Test Tube Chess shown in C.N. 10700 can be looked into, given that 27 December 1921 was not a Sunday. 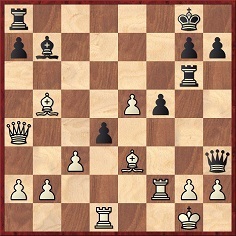 In the final round of the New York, 1857 tournament, Morphy defeated Louis Paulsen +5 –1 =2. 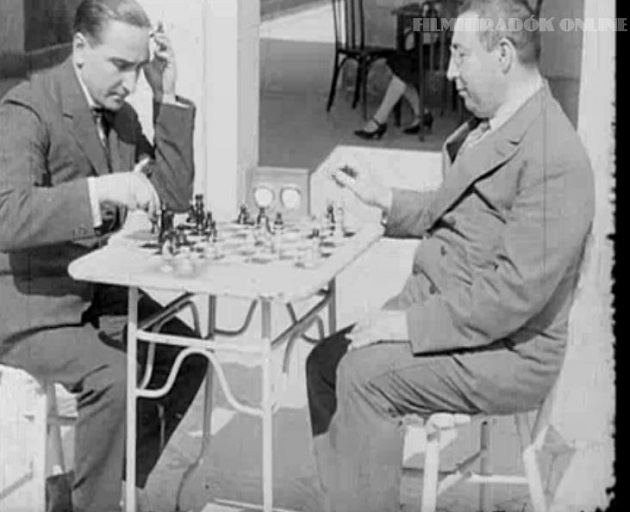 According to the Lange, Maróczy and Sergeant monographs on Morphy, the dates of the eight games were as follows: First: 29 October; Second: 30 October; Third: 2 November; Fourth: 4 November; Fifth: 6 November; Sixth: 8 November; Seventh: 8 November; Eighth: 10 November. 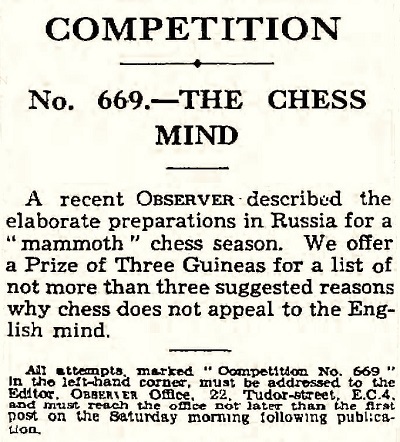 ‘My particular interest is in the dates of the concluding games between Morphy and Paulsen. 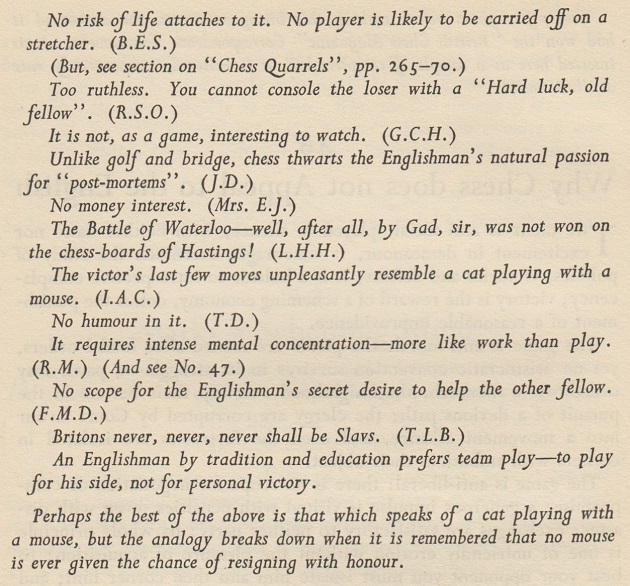 The New York, 1857 tournament book is rather vague and not altogether trustworthy. 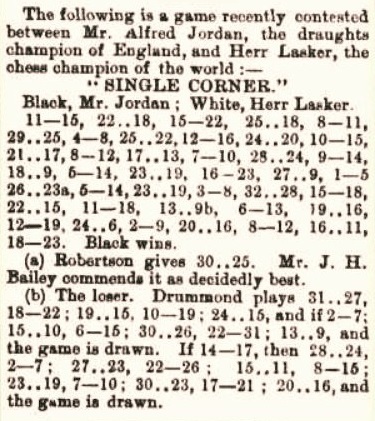 On page 68 of Paul Morphy The Pride and Sorrow of Chess (New York, 1976) David Lawson stated that the sixth game was played on 3 November, and page 71 gave 6 November and 10 November as the respective dates of the seventh and eighth games. There was no explanation for the gaps in the schedule. 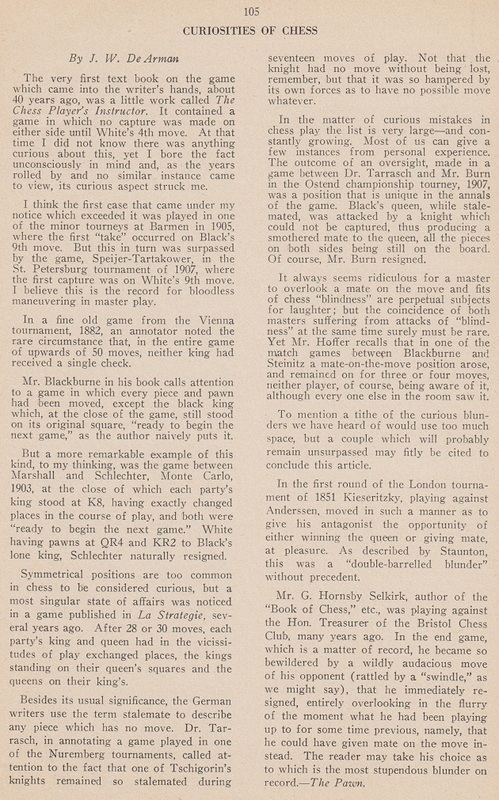 Alan McGowan (Waterloo, Canada) draws attention to his Chess Scotland webpage on a mysterious figure, Ralph Spencer (‘formerly Rolf Silberberg’ and also named ‘Silverberg’). 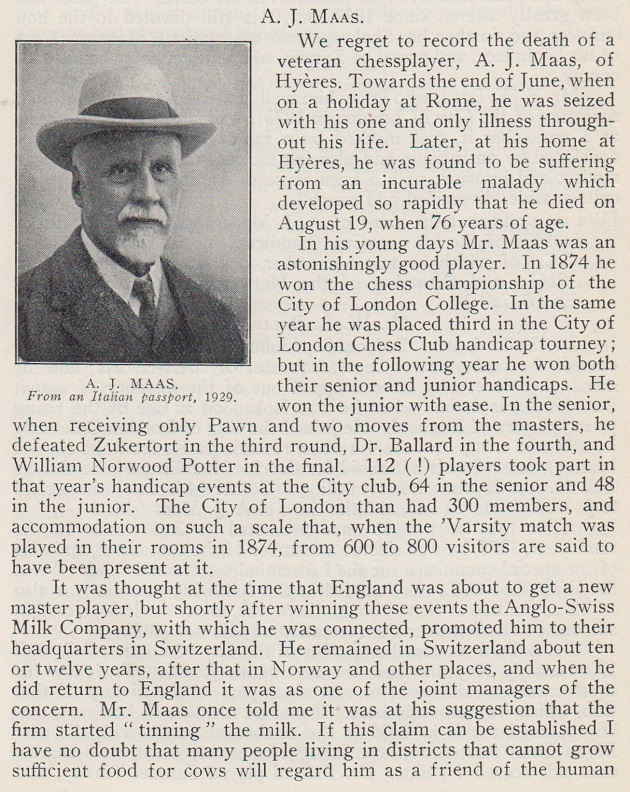 Our correspondent wonders whether Ralph Spencer was the Silberberg who participated in a tournament in Paris in 1938. 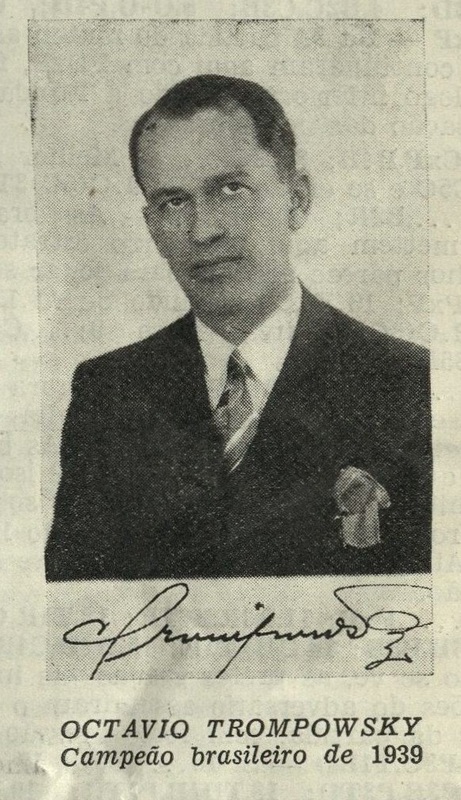 Deutsche Schachzeitung, August 1938, page 234. Acknowledgement for the page from The Pawn: the Cleveland Public Library. Readers will note for themselves the article’s many defects. 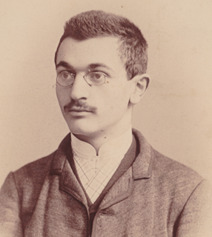 John W. De Arman, or DeArman, was discussed in C.N.s 7572 and 7598. 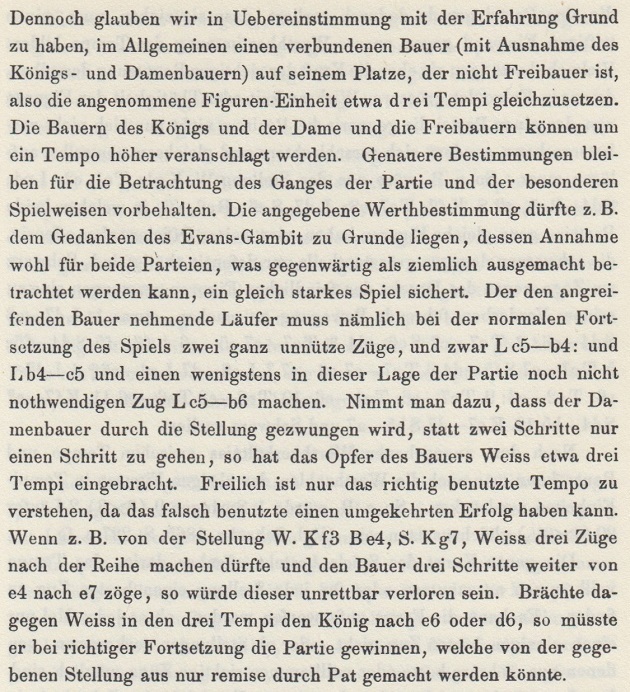 Source: Das interessante Blatt, 5 November 1885, page 6. This picture of Zukertort is a much better version of the one shown in C.N. 8514. Source: Österreichs Illustrierte Zeitung, 28 September 1902, page 892. The website has the incorrect date 28 August 1902. 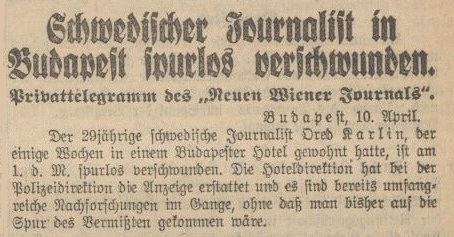 Our correspondent also draws attention to an interview with Ossip Bernstein on pages 4-5 of the Neues Wiener Journal, 3 November 1925. ‘In June 1889 Emanuel Lasker won a tournament at the Café Kaiserhof in Berlin. 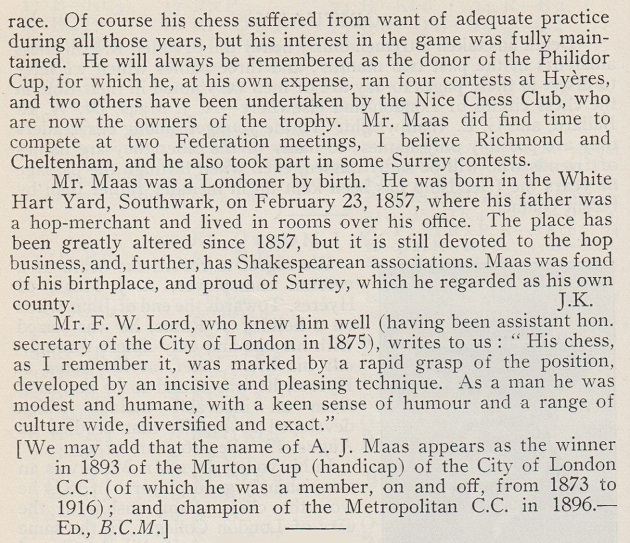 From a biographical note in the Chess Monthly, April 1890, page 226: “His first success dates from June 1889, when he won the first prize in a tournament at the Kaiserhof, Berlin, without losing a single game.” In an interview with the Berliner Schachzeitung (the issues of 1 and 16 April 1896, pages 3-7 and 18-21) Lasker mentioned that he had won every game in a tournament organized among students at the Café Kaiserhof, that each participant paid one Thaler and that the winner was to take everything: “Um jene Zeit wurde von mehreren hiesigen Studenten ein Turnier im Café Kaiserhof veranstaltet, in der Weise, dass jeder Teilnehmer einen Thaler einzuzahlen hatte und der Sieger den ‘Pot’ gewinnen sollte. 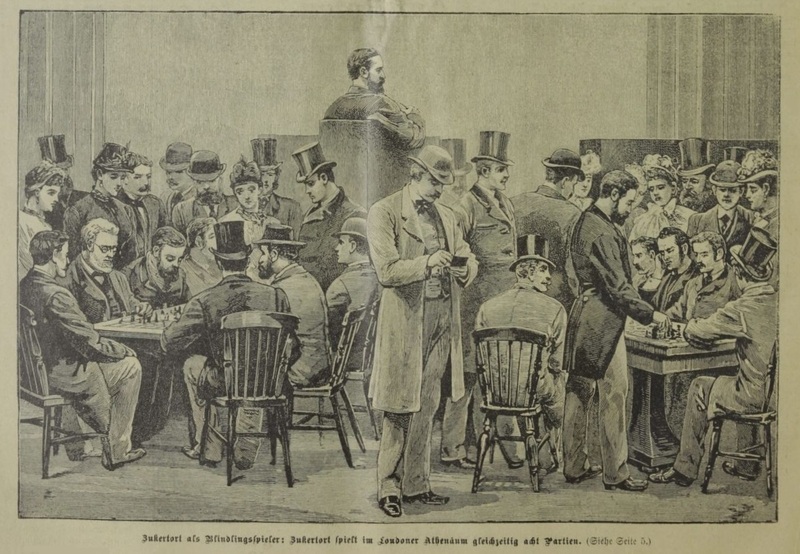 Hierbei gewann ich sämmtliche Partieen und damit den Preis.” Lasker’s victory in all the games in the Kaiserhof tournament is confirmed by a report in Deutsches Wochenschach, 8 April 1894, page 116, which mentioned that Karl Holländer came second. 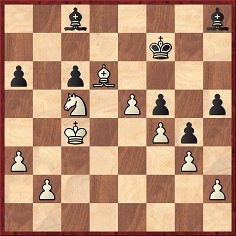 After 1...a5 2 Rd7 Rb1 White was unable to take the queen because of 3...Nf2+ 4 Nxf2 Rxg1+ 5 Kxg1 Re1 mate, and Black went on to win after 3 Rdd1 Rxd1 4 Rxd1 Nxc3. 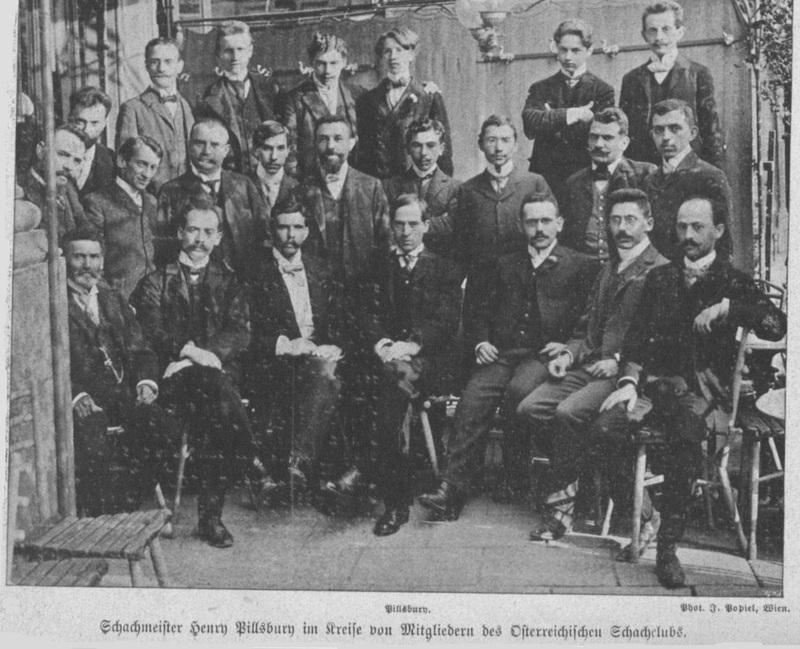 However, the Breslau, 1889 group photograph seems elusive. Has it ever been published? 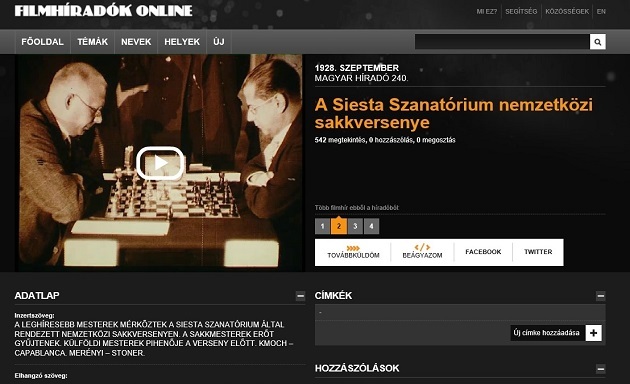 ... as well items with footage of Maróczy, Réti, Rubinstein and Tartakower. 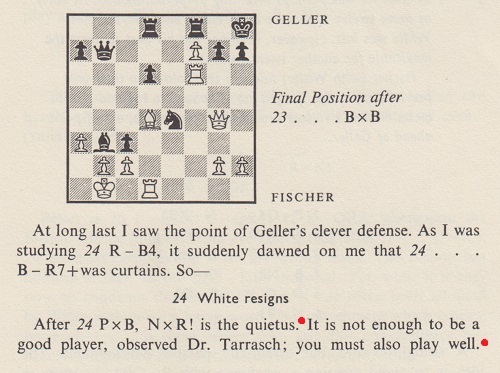 Further comments on Steinitz by Rhoda A. Bowles, from pages 25-26 of The Year-Book of Chess, 1907 by E.A. Michell (London, 1907), are given in Steinitz v von Bardeleben. 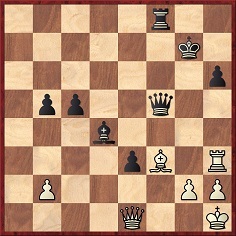 57...Rf1+ 58 Kg2 Rg1+ 59 Kf3 e1(Q) 60 Kf4+ Kd2 61 White resigns. 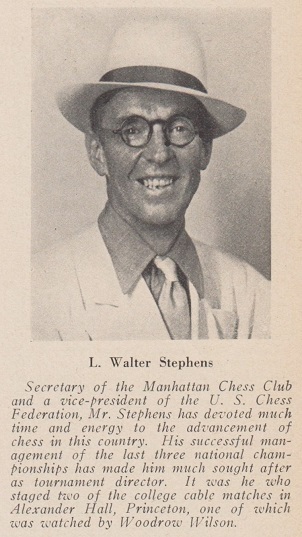 See too page 116 of the May 1941 Chess Review, which had a biographical note on Stephens, a photograph of him and his win over Blumin. The above are the best-quality scans that we are able to show, with the assistance of the Cleveland Public Library. 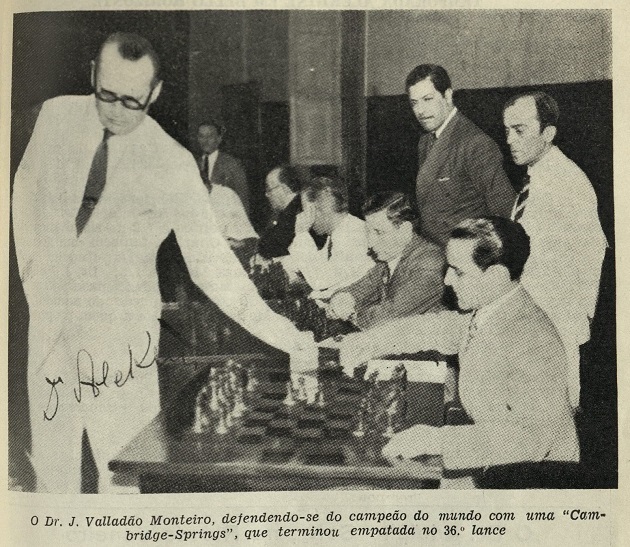 Regarding Alekhine v Joaquim Valladão Monteiro, see C.N. 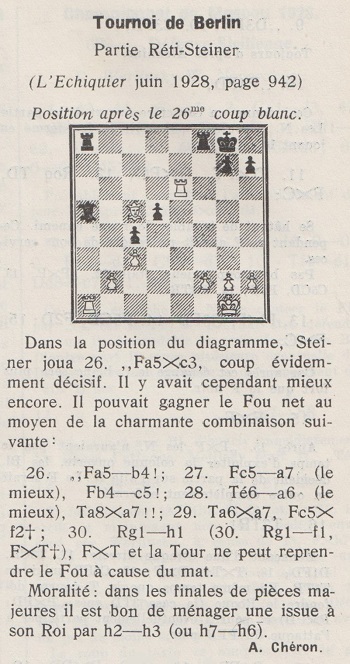 3270 (Chess Facts and Fables, pages 18-19). Further information about Valladão Monteiro is in C.N.s 3884, 3887, 4173 and 5799. 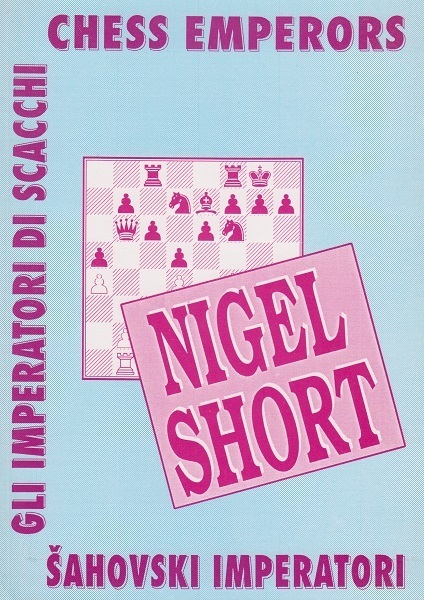 Sean Robinson (Tacoma, WA, USA) expresses disappointment at the small number, and low quality, of books about Nigel Short, notwithstanding his stature as the only British player to contest a world championship match in the modern era. There is certainly a significant gap in the market. Although our shelf has monographs on Short published in Argentina, Germany, Hungary, Spain, the United Kingdom and the United States, they are mostly booklets, and only the 79-page volume from Hungary, which covered the period 1990-95, came out after 1993. 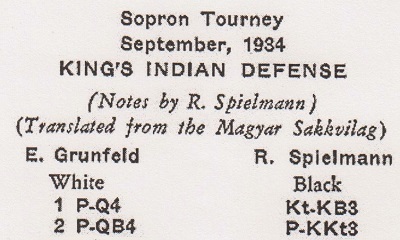 Source: the introduction to item 72 of unit one of Napier’s Amenities and Background of Chess-Play (New York, 1934), the inside front cover of the September 1956 Chess Review and page 143 of Paul Morphy and The Golden Age of Chess (New York, 1957 and 1971). Michael Allard (Bowie, MD, USA) notes a book with extensive treatment of the games of Nigel Short and Jan Timman: The Way to Linares’ Summit by Alexander Kulagin (Würzburg, 1993). 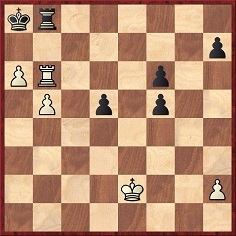 Page 70 of The Big Book of World Chess Championships by A. Schulz (Alkmaar, 2016) states that Dawid Janowsky ‘died, only 56 years old, alone and completely penniless’. For photographs of Maas, see C.N. 3606 and (a group picture also featuring Janowsky) C.N. 4023. 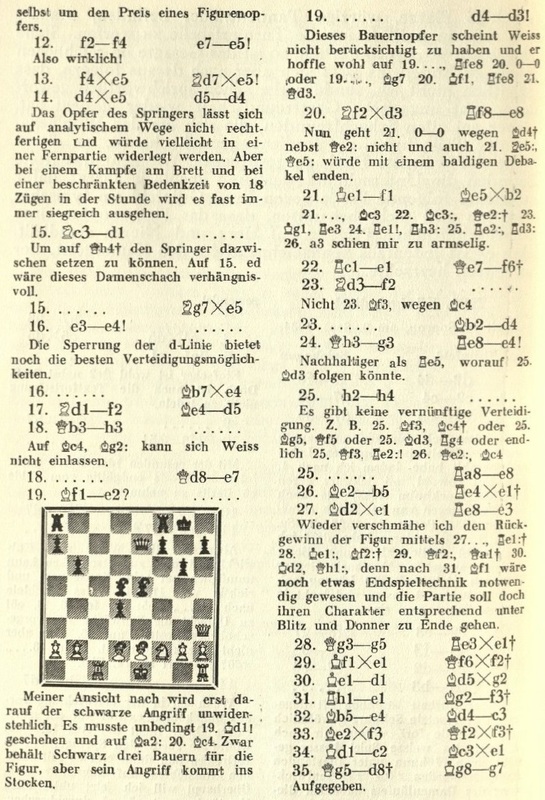 This comes from an article entitled ‘Synthetische Grundlage zur Theorie des Schach’ by Eugen von Schmidt. 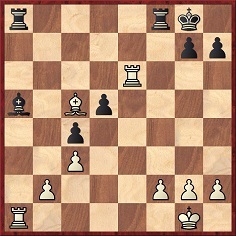 23 Bg5 Rxg5 24 Bc6 Bxc6 25 Qxc6 Rf8 26 Qe6+ Kh8 27 Qe7 Resigns. 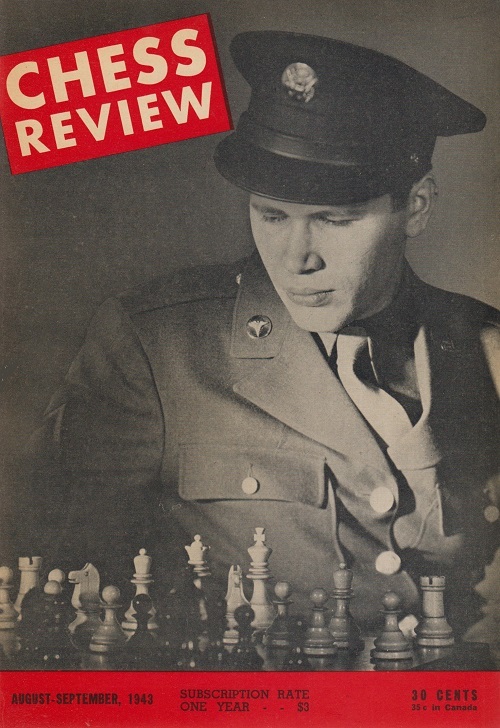 Sources: American Chess Bulletin, March-April 1940, page 48, and Chess Review, April 1940, page 58. 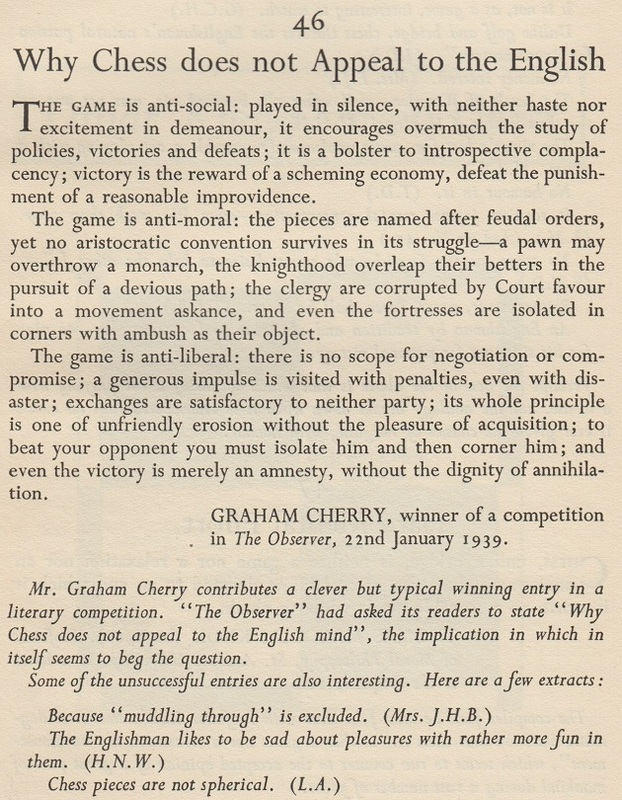 If that was indeed the tournament, it is remarkable if the full game was not published earlier than 1936. As with the Tagesbote article (C.N. 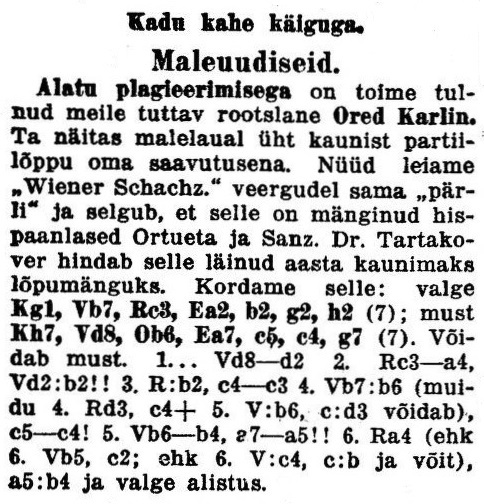 8830), it appears that Karlin suggested that the position was from one of his own games. 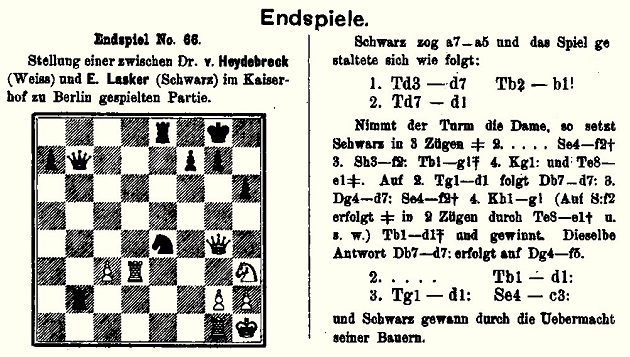 Soon afterwards, however, the writer noticed the feature on page 356 of the December 1934 Wiener Schachzeitung which credited it to the Ortueta-Sanz game. 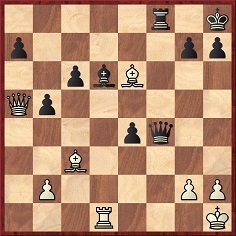 The position in the Tagesbote column of 14 April 1934 shows white pawns on a2, b2, g2, f3 and e4 (no pawn on h2). 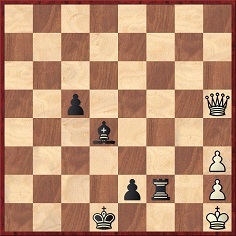 L’Echiquier, 8 August 1934, page 586, the Deutsche Schachblätter, 15 August 1934, page 249, and the Wiener Schachzeitung, December 1934, page 356, had white pawns at a2, b2, g2 and h2, as did the above column in Esmaspäev. 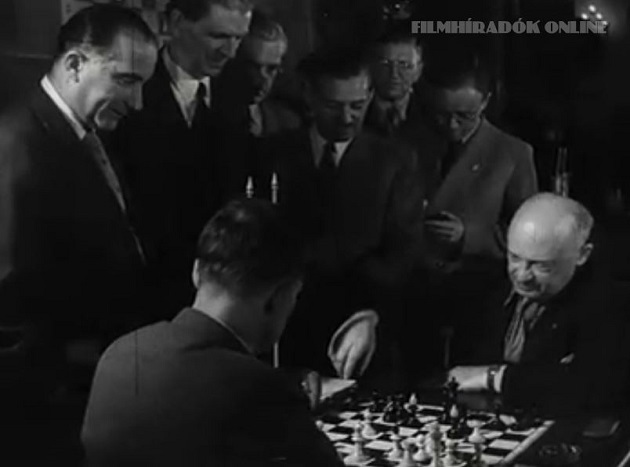 Concerning the Rice Gambit match between Emanuel Lasker and Carl Schlechter, C.N. 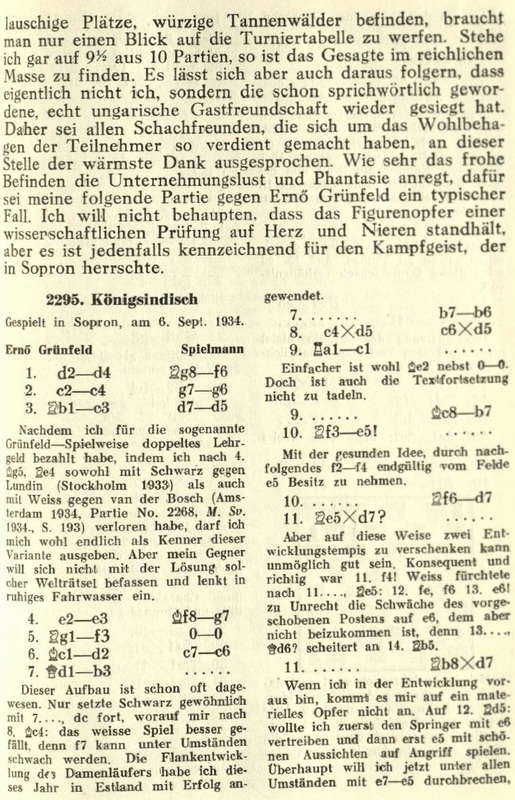 6857 showed a report in the Deutsche Schachzeitung that the result was +3 –0 =2 in favour of Schlechter. Our correspondent adds that a complete run of Schlechter’s column is available on-line. 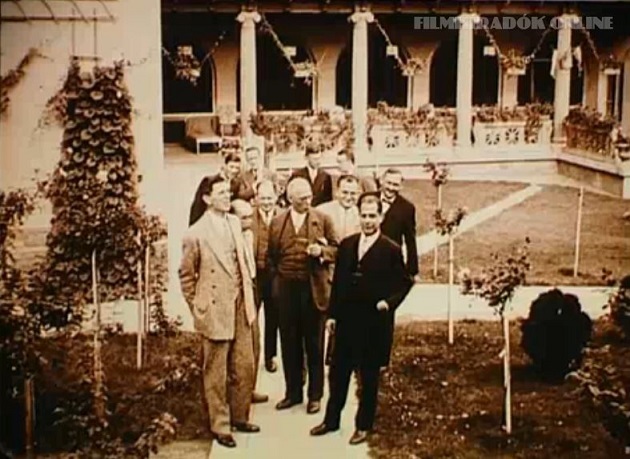 ‘The international tournament in Madrid in 1933 was played from 22 to 28 May in the Casino Militar (Centro Cultural del Ejército y de la Armada). 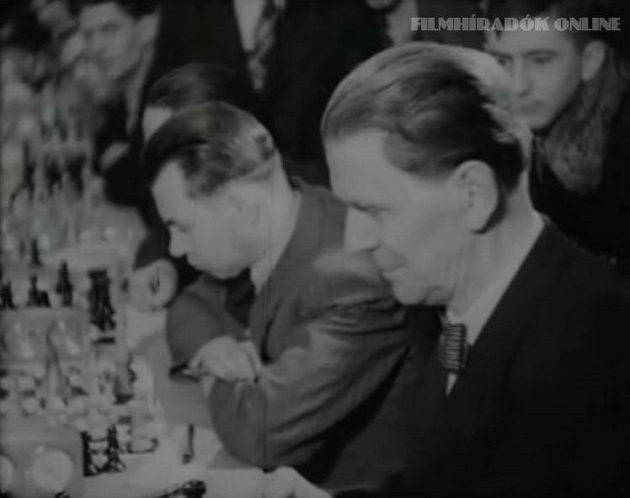 The participants were Ored Karlin (Sweden), Willy Kocher (Switzerland) and the Spanish players Vicente Almirall (the winner), Lotario Añón, Alfonso Cadenas, Martín de Ortueta, José Sanz and Ramón Tramoyeres. Sources: the Madrid newspapers Luz, 24 May 1933, page 14, El Sol, 24 May 1933, page 8, and subsequent issues. The main prizes were: 500 pesetas, 300 pesetas and 200 pesetas. The event was covered by the local press and particularly Luz and El Sol. 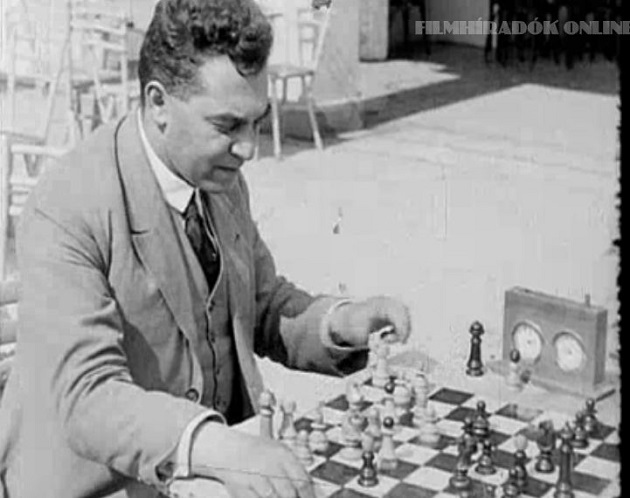 The Luz chess columnist was José Sanz himself, and the reporter in El Sol was Pedro Sánchez de Neyra y Castro, Marquis of Casa Alta, who was the arbiter of the tournament. No incident occurred until the last round. Sanz simply wrote about his game: “Sanz ½ Karlin ½. 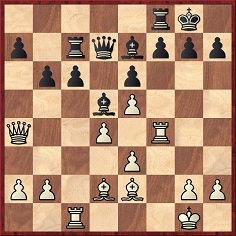 Interesting theoretical variation in the Cambridge Springs. 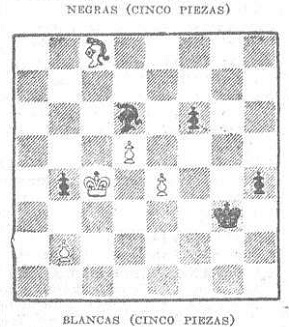 White needs a win to take second place, but all the variations lead to a draw.” Source: Luz, 30 May 1933, page 14. 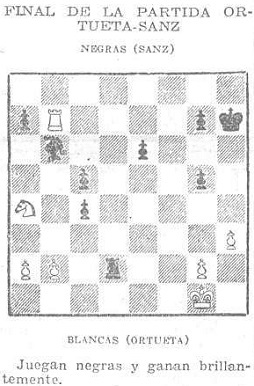 However, on page 8 of El Sol, 1 June 1933 Casa Alta inserted a position (shown below) from that Sanz-Karlin encounter, and wrote that Karlin would have a won game after ...h3 but played differently and only drew. Insinuating some kind of collusion, Casa Alta reported that the next day he even confronted Karlin and asked for an explanation. Karlin replied that he “had a headache”. Sanz answered the accusation (that “the Swedish master gave away the draw”) in his column by noting that Karlin had previously offered a draw twice and that he had refused. The feud continued over the following weeks. Meanwhile, two matches with a purse were arranged, also at the Centro Cultural del Ejército y de la Armada: Karlin v Almirall and Ortueta v Sanz. In El Sol of 4 June 1933, page 10 Casa Alta replied to Sanz’s response and gave the latest scores in the two matches. For Karlin v Almirall he stated that the first game was won by Karlin and the second was drawn; the third game was being played on 3 June. The score of the Ortueta v Sanz match was reported as a victory by Ortueta in the first game, followed by two draws. 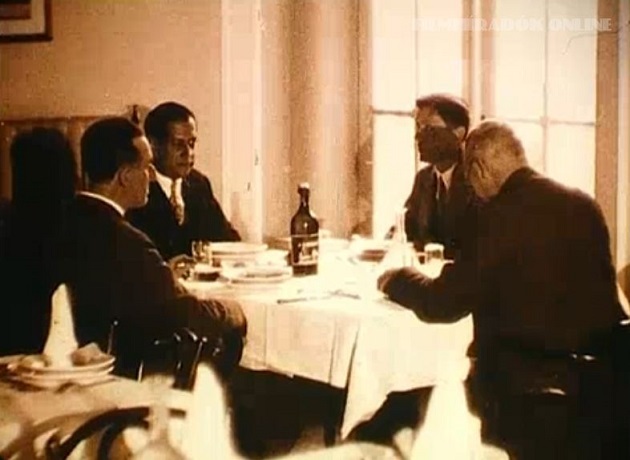 The former contest ended in a tie 2½-2½, as stated by ABC on 7 June 1933, El Sol on 8 June 1933, and Luz on 9 June 1933. The dates of play were probably 1-5 June. Karlin left Madrid on 10 June for Saragossa, where, on 11 June, he played Ramón Rey Ardid. Sources: El Sol, 13 June 1933, page 6, and El Mundo Deportivo, 18 June 1933, page 3. 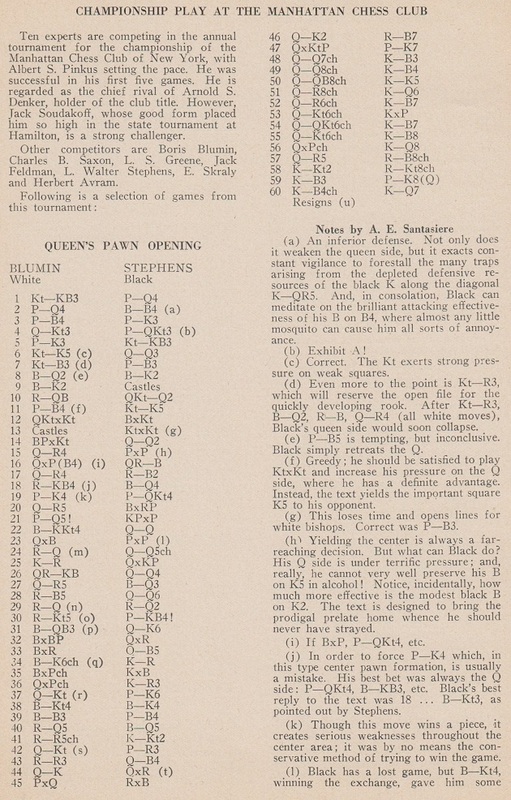 In El Sol, 18 June 1933, page 10 Casa Alta reported that the Ortueta-Sanz match had been suspended when the score was 2½-1½ and gave a game in which Ortueta (Black) won in 36 moves. There is a discrepancy in the match score as given in Casa Alta’s columns. 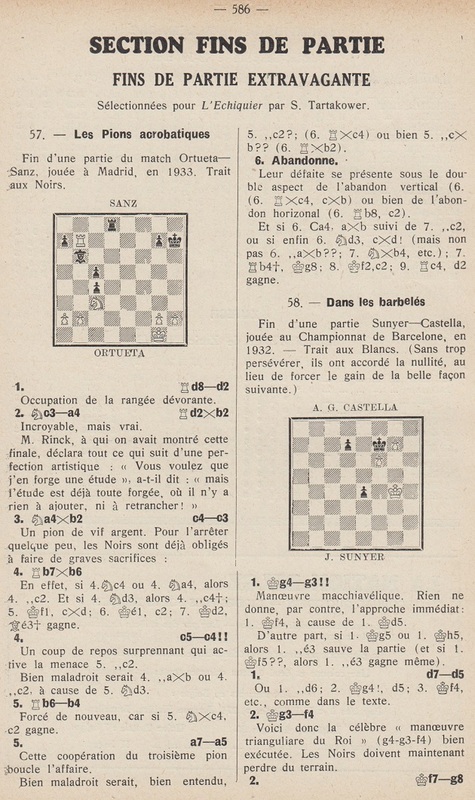 The famous combination occurred in an actual game between Ortueta and Sanz. 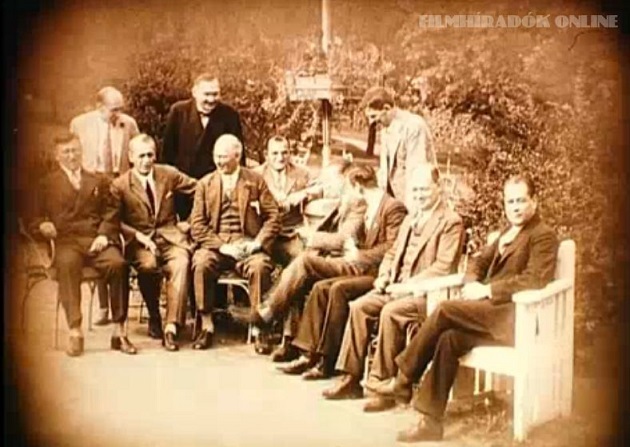 It was the penultimate game in a public match, played in the first week of June 1933 at a renowned club in Madrid. On 11 June 1933 Casa Alta published a key position preceding the combination, either because he was a witness or because he had a reliable source. Although the issue of the combination’s authenticity arose later, Casa Alta did not question it, notwithstanding the fact that he was in the midst of a feud with the winner, Sanz. Page 207 recorded that W.B. 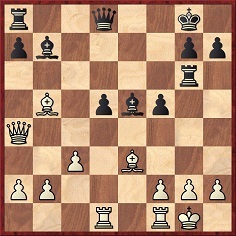 Dixon and Alfred Gunsberg had sent the solution: 1 Rxb8+ Kxb8 2 b6 f4 3 Kf3 f5 4 Kxf4 d4 5 Ke5 d3 6 Kd6 d2 7 a7+ Kb7 8 a8(Q)+ Kxa8 9 Kc7 d1(Q) 10 b7+ Ka7 11 b8(Q)+ Ka6 12 Qb6 mate. 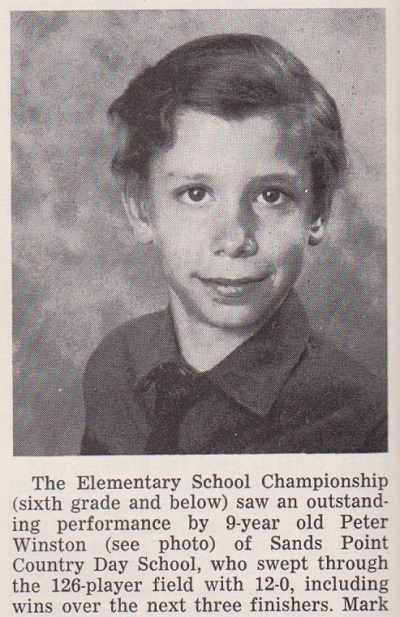 Source: Chess Life, April 1968, page 140.